Mass: The Quest to Understand Matter from Greek Atoms to Quantum Fields by Jim Baggot is an in-depth study of the “stuff” that surrounds us. Baggot is currently a freelance science writer. A graduate of Manchester with a degree in chemistry and a PhD in physical chemistry from Oxford, he was a lecturer at the University of Reading and is the author of several books on quantum physics and reality. Three years ago I read Baggott’s Farewell to Reality which I found to be very informative and written at a level where the information was understandable and yet not dumbed down. The same formula is followed in Mass. There is a rising level of knowledge needed as this book progresses. Considering the timeline this book covers most of the information can be grasped by those with a moderate science background. The idea of mass, matter, has evolved over the ages. It is all around us and yet we know so little about what it actually is. It is more than fire, earth, air, and water. The idea that atoms were indivisible has since passed and even the concept they are the smallest particles with it. Even the particles that make up the nucleus of atoms are made up of other particles. All that is solid around us is mostly empty space and empty space we find isn’t really empty. Baggot starts off with the ancient Greeks and their developing understanding of the world around them. He works to put the reader in the mindset of the historical philosophers and scientists. We have the advantage of technology and a long history of experimentation. The Greeks were innovative and as wrong as they appear today, at the time it was advanced thinking. Baggot takes the reader through the Newtonian period and into Einstein without much math or formulas. The history of discovery and ensuing problems, from the ancients to the present, is very well done. Determining what exactly mass is a long and developing problem. Science strives to find elegance and simplicity — f=m*a or e=mc^2. Still, Einstien simplified complex problems with thought experiments and Feynman use the diagrams that bear his name. Einstein also initially believed in a static universe and created a cosmological constant to balance his equations. The problem was the universe is not static, but his cosmological constant did help in the search for dark matter and energy which make up most of the universe. The harder we look the more we find. Schrodinger had his cat, but string theory is stuck with complex math and many dimensions. The study of mass has moved from observation to a point where observation interferes with the experiment. The more we discover. The more we have to learn and the more complex the science and math gets. 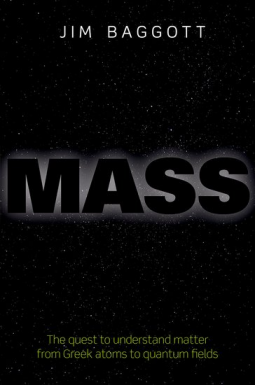 Mass is an interesting history and science book. It shows that every time we think we understand what makes up the universe we find another hidden layer and a more complex explanation. Baggot does not show us the next layer of physics to be discovered nor does he add to the explanation of the universe. He does do a very good job of explaining how we got to where we are. The art of fiction is the relationship between the reader and the text. When the text is short more needs to be pulled from shared experiences or ideas. Opening that shared experience is the art. Not everything is a circus, clowns, or dark, but those were the strongest triggers for me. 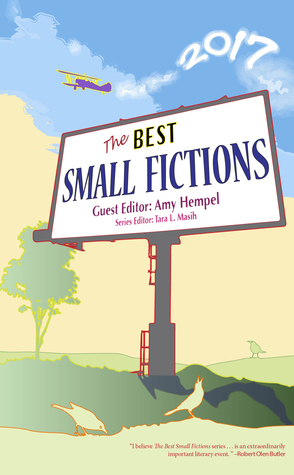 Other stories surprise with an unexpected twist. But all the fictions have one thing in common. They are complete and greater than the sum of their words. 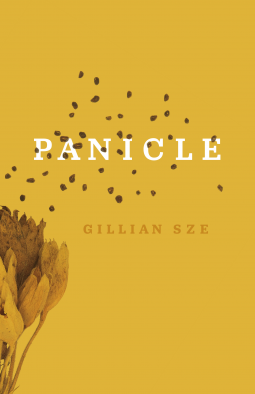 Panicle by Gillian Sze is the author’s ninth poetry collection. Her work includes Peeling Rambutan (Gaspereau Press, 2014) and Redrafting Winter (BuschekBooks, 2015), both of which were finalists for the QWF A.M. Klein Prize for Poetry. Sze’s work has appeared in a number of literary journals and has received awards such as the University of Winnipeg Writers’ Circle Prize and the 2011 3Macs carte blanche Prize. A panicle is defined as any loose, diversely branching flower cluster. Oats are a common example of this type of plant. Sze refers to lupines, a panicle, in her collection. Lupines are typically violet or blue which brings in another theme in the collection. Blue is the color of the sky but in this collection, it is also the color of water. Water is presented throughout the collection as rain, ice, hail, the water cycle, a flooded ditch, stagnant water in a paper cup with a daisy, ripples in the cove, and a waterfall. sounds blue and it comes from all directions. The poems in the collection are narrative in nature and most are inspired by a quote, a poet, or piece of art. Some poems are descriptions of scenes. There are a series of tableau poems and a series called “Seven Takes.” The third “take” provides a nice ananolgy, in parable form, of what we are destined to become in life. Much like a panicle plant with many flowers branching off the same stalk life has many branches that we can choose from yet all are interconnected through the main stalk. The third section is a tribute to a Roland Giguère work with supporting artwork. The collection ends with the title poem “Panicle”. Here is a convergence of the complete work. Much like the climax of a story, we reach the high point of the poet’s work. The themes and ideas throughout the collection are brought together in an artful closing. Sze gives the reader a collection filled with imagery and imagination and invites the reader to look deeper. An inspired and inspiring collection. 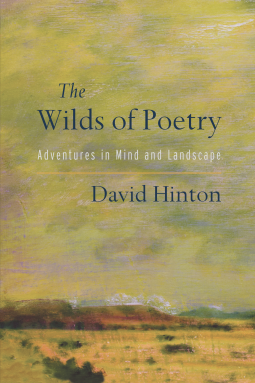 The Wilds of Poetry: Adventures in Mind and Landscape by David Hinton is an exploration of American nature poetry and its evolution in language. Hinton is a writer and translator who has produced a body of work exploring the weave of consciousness and landscape. This exploration is informed throughout by the insights of ancient Chinese culture; and it has primarily taken the form of translation, which he uses as a way to make contemporary poetry that operates outside the limitations of self-identity and the Western intellectual tradition. Hinton Starts with Henry David Thoreau’s trip to climb Mount Katahdin in Maine and Thoreau’s enlightenment in nature. He explains and uses the examples of several poets from Thoreau forward to modern writers. It is the East versus West in thinking and writing that present the issue of Poetics between the two writings and culture. America is the setting for the poetry and provides, in many instances, completely untamed wilderness: Mount Katahdin for Thoreau and the American West for others. Western writers from earlier ages were tied to the earth through the Biblical interpretations and taking dominion over the earth. This meant everything from protective stewardship to plundering nature. The Eastern view is much different in the placement of man in nature. Man is part of nature; it is not something man comes into. The Western view may also have been contaminated by man’s separation from nature. We live in cities and see nature as something visited in parks and zoos. The Eastern Zen and Taoist views are different. Another aspect is in the writing itself is that the Chinese used symbols instead of words to describe ideas, places, and objects and it does so without the use of punctuation. It does better and more concise job of conveying meaning than words. A picture is worth a thousand words, so to speak. The preciseness presenting a complete picture with a minimal amount of symbols was a goal and it was taken to its most extreme form in very short poems, the Japanese haiku, for example. If the reader is familiar with Jack Kerouac’s Dharma Bums he or she will recall Japhy (Gary Snyder) explaining translation to Ray (Kerouac) using “Cold Mountain”. Hinton does the same in a more scholarly style and depth. It is difficult, if not impossible, to accurately translate the poems for Chinese or Japanese and still convey the meaning and simplicity of the original. Hinton uses several poets to show various methods of reconciling Western (American) poetry with Eastern thought or vision. He presents his thesis and explains it in detail and follows up with several of that poet’s works to support the essays. Overall, this is an informative work for those interested in the evolution of American nature poetry or Eastern poetry and the merger of both. The different styles used by the several poets shows, in the spirit of Cold Mountain, that “There are many paths to the top of the mountain, but the view is always the same.” Well done and an informative book on and about poetry.